Pre-heat the oven to 170 degrees (fan). Line a cupcake baking tray with 12 cake cases. Mix the eggs, sugar, butter and peppermint extract in a bowl using a hand whisk, electric whisk or stand mixer. Sift the self-raising flour, baking powder and cocoa powder into the mixture and mix together. I use the figure of 8 technique here when mixing by hand. Fill 2/3 of the cupcake cases with the cake mixture and bake for between 12 and 18 minutes. Mine took 16 minutes. Once baked, allow the cupcakes to cool for approximately 30 minutes. Remember to check they’re cooked through with a cake tester before removing from the oven. While the cupcakes are cooling, add 170g of butter to a clean bowl. Whisk the butter for at least 5 minutes. Add the peppermint extract and whisk for another minute. You might want to add just 2 tsp at this stage and add the 3rd later to suit your taste (I like really minty frosting). Sift the icing sugar and whisk together in stages. This will help you to achieve a really smooth buttercream but will also help to limit those icing sugar clouds! Once whisked, your buttercream should be a very light colour and smooth consistency, but still able to hold it’s shape. Place 2 tsp in a separate small bowl. Mix a small amount of blue food colouring into the buttercream in the small bowl. Mix the food colouring and the buttercream until you achieve a really strong and concentrated colour. Including this step will help the colour to spread more evenly through your whole mixture. Add the colour concentrated buttercream to your large mixture and whisk together until the mixture is fully combined. If you want a darker colour, simply follow steps 9-12 again. Using an open star piping nozzle, pipe a ‘classic swirl’ onto each cupcake. Add a small amount of dark chocolate chips to the top of each and your cupcakes are finished! 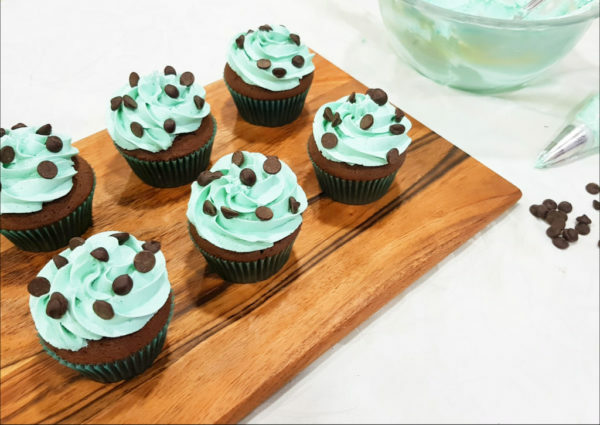 The result of the perfect combination of mint and chocolate.